I’ve explored the entire map, perhaps not all its contents. However I’ve marked all points in which there are Bandit/Cuman camps. Happy Hunting! *Note - the Pribsylavitz camp has around 27 enemies, these stop spawning after you have raided the camp for the main quest. Also a clean map if people wish to utilize for some purpose. Money restock and best guide to your economy's health? Where can I go to find enemies? Raiders Quest - no waypoint? PS: Thanks for the map! @MakoareTES Can’t open or see your image there. When I see it I’ll save it and stitch it on. Thanks. And your welcome. I’ll stitch it on in the morning! Honestly figured one belonged down in those woods, but I searched too deep when clearing the clouds and missed it. Sorry, it was my first time uploading an image, I fixed it! I was surprised also to see that there are no complete maps online yet. Mine is the most complete. Just want to clean it up of all the extra quest marks and such. @MakoareTES Thanks again, updated the map with the new locations. I’m going to do touchups (removing quest locations) so it’s cleaner. And I’ll release the full map without any markings at all. This will be done later tonight however. Do these camps respawn and if so how often? I’ve only come across one when collecting the treasures of the past but never went back. Yes they Respawn, I think everyday. Honestly haven’t check. Maybe 2 days at most. Only that the most northern camp there with the 27 Cumans/Bandits Stops Respawn isn’t after you raid it during the main quest line. Not sure if it continues to Respawn later down the road yet tho. Updated the map and cleaned up a bit more. Think I have found em all now. There were a few camps I came across that were empty, not sure if these will be filled later in the campaign, will have to check later (didn’t mark these). Also included a clean map if people wish to save to edit for their own purposes. They do respawn! Ive cleared some of these 10x over. 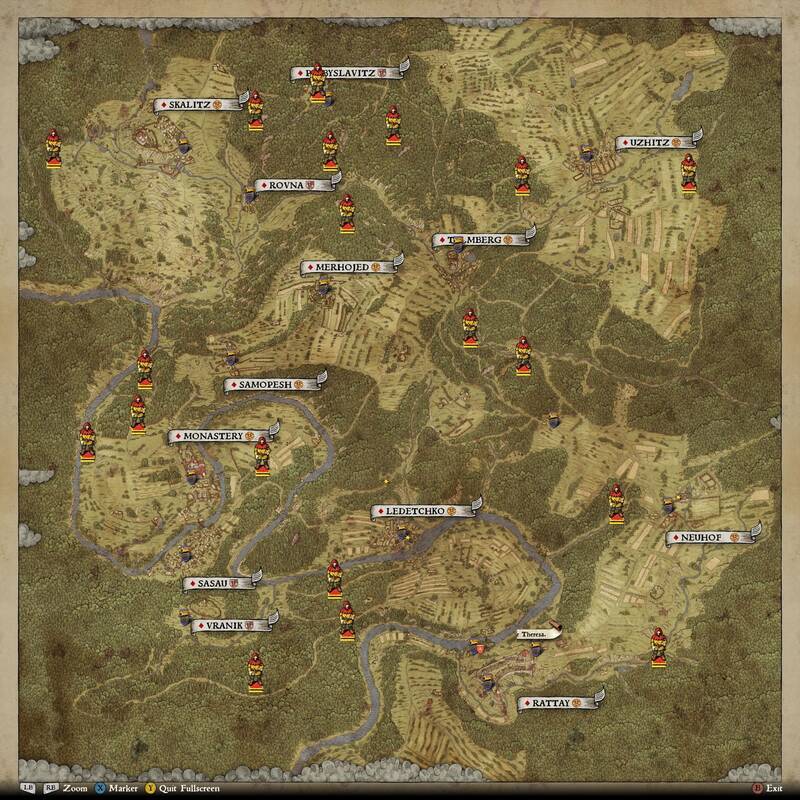 Even the most northern camp Pribsylavitz does respawn and has around 27 enemies. That place just stops respawning after you raid it during the campaign. But I cleared it 3 times on my own prior. There are a few camps that are empty that I’ve found too. Since they were empty I didn’t mark them. But I can assure you the enemies to return for another beating. This map is excellent, I’ve been using it to hunt those Cuman dogs while leveling up my Bow skill. I think I found a new one for you. I hope you can see my image. Expect to find ~4 bandits there, one of which is well armored. Just curious if you could show a map with cumin only camps? the bandits are way to easy for me even when there is 4 or more. thanks in advance. Indeed really nice map! Thanks a lot. The possibility to add our own markers are a really great feature! We may appreciate the same in game, or perhaps a mod may do that? Twice now, that bandit camp west of neuhof glitched out on me. After I killed them all, the battle never stopped. I had to reload from a save both time. I tried waiting around, looking around to see if I missed somebody… nothing worked. 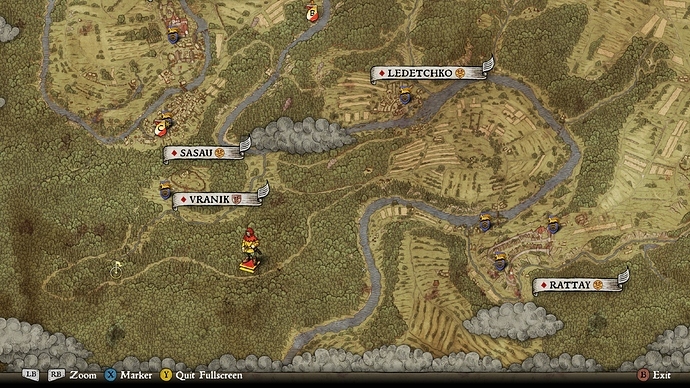 I tried riding all the way back to rattay… still in combat. Couldn’t talk to anybody. I avoid that one now. Thanks mate. My Henry is bloodthirsty, he’s gone berserk now, hunger for more blood.